Main Screen - Retirement Savings Graph: View accumulating savings and investments up to start of retirement as well as during retirement when it typically is spent down. Main Screen - Retirement Income Graph: most powerful view; see whether various income sources and investments can provide enough retirement income each year to meet your income needs. Red means you have "run out of money". 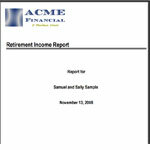 Main Screen - Retirement Spreadsheet: view the detailed year-by-year numbers in an easy-to-read spreadsheet style grid. Add Unlimited Investments : add unlimited number of investments. You enter the Description, Value, Estimated Returns, and Tax Type. Software will then calculate totals and blended returns for each type of investment. Add Various Retirement Cash Infusions : add unlimited cash infusions including things like part-time job, retirement severance, sell or downsize your home, deferred compensation, rental property income, spouse continues working, multiple pensions or other defined benefits, annuity payments, inheritances, sale of business, etc. You can enter anything you want as the description and control when the expense is added to the calculations. Add Various Special Expenses - add unlimited special expenses above and beyond your inflated retirement income needs goal including things like 72t payments, college funding, long term care costs, long term care insurance, medical costs, buy an RV, big travel or vacations, purchase of beach home, etc. You can enter anything you want as the description and control when the expense is added to the calculations.